Aloha! Need help to plan a trip to Hawaii? We just spent an incredible two weeks exploring the best of the Hawaiian islands. The trip wasn’t completely seamless to plan though. Even though you’re traveling to the United States, the 50th state almost feels like another country. There are few destinations in the world that attract quite as many people as Hawaii. This means tourism is big business and there is a multitude of options that at times can feel overwhelming. It doesn’t have to be that way if you have a clear idea of what you want to do and where you want to travel. 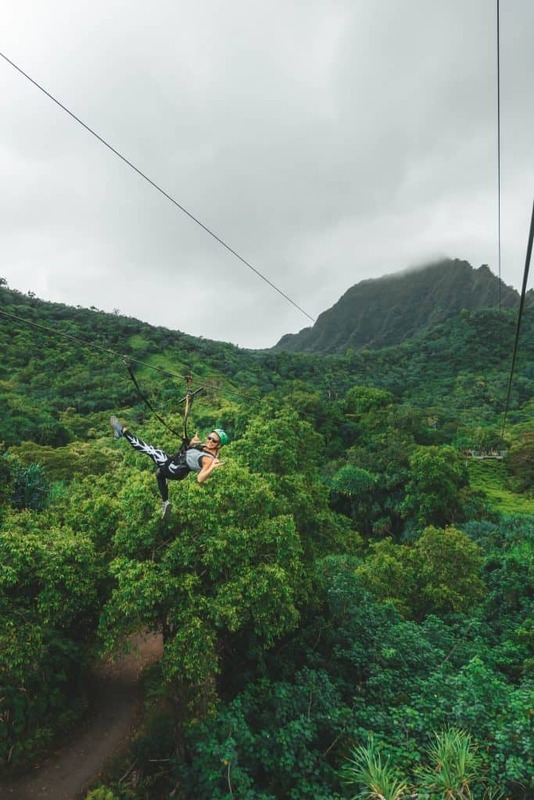 Here’s how we suggest planning your first trip to Hawaii. The first step in planning your trip to Hawaii is to know what you want. It’s great to do research on which islands you would like to visit. Each island has its own flavor, landscapes, and experiences. With their own unique selling point choosing the right spot can be pretty difficult. We had two weeks to galavant around and ended up going to the four most popular islands of Hawaii. Here’s an overview of each island and what we thought. This is the classic island of Hawaii, its home to Waikiki, Pearl Harbor, the North Shore, Lanikai Beach, and some very infamous hikes. It’s often referred to as the “Heart of Hawaii.” The island packs a punch with a ton of sights, beaches, and hotels. It is also the most popular island and prone to horrendous traffic and waves of tourist. It’s the primary hub in Hawaii with 85% of the state population living here on the island. Daniel K. Inouye International Airport is situated in Honolulu and is the main access point in/out of Hawaii. There is no shortage of hotels and resorts to enjoy while on vacation. One of the most popular Hawaiian Islands and for good reason. Maui has just about everything in a convenient size that means you don’t have to drive for hours like its neighbor, the island of Hawaii. It’s sometimes referred to as the “honeymooner’s island,” and we can attest to that after witnessing four weddings in an afternoon on one small beach. It’s well known for having some fantastic beach resorts, golf courses, the Road to Hana, and Molokini Crater. This is the youngest and largest island of the Hawaiian Islands, and it’s near twice as big as all the other islands combined. It should be self-explanatory why Hawaii is better known as the “Big Island.” It also happens to have the most volcanic activity and is where you will find Hawaii Volcanoes National Park. An impressive island no doubt with a massive amount of climate zones. Due to its unique geology, you can find all but four of the world’s climate zones. 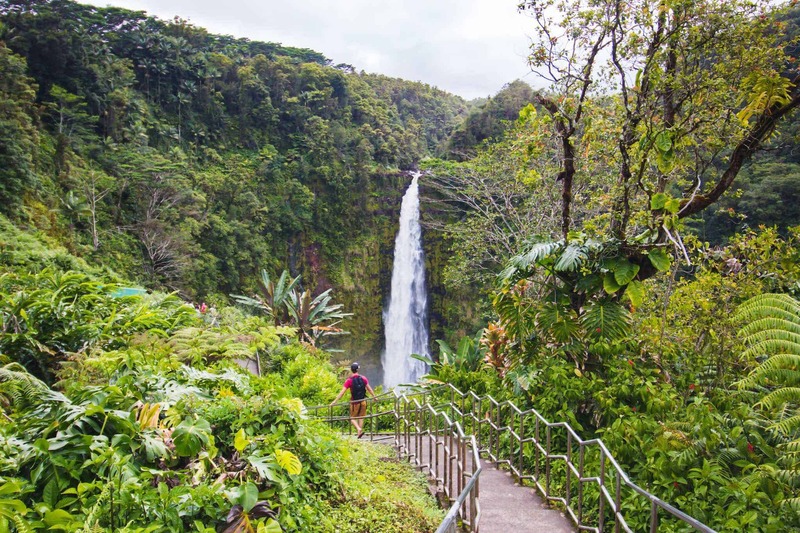 It’s truly impressive that one day you can go from black sand beaches to rolling pastures or snow-capped peaks to lush rainforests. 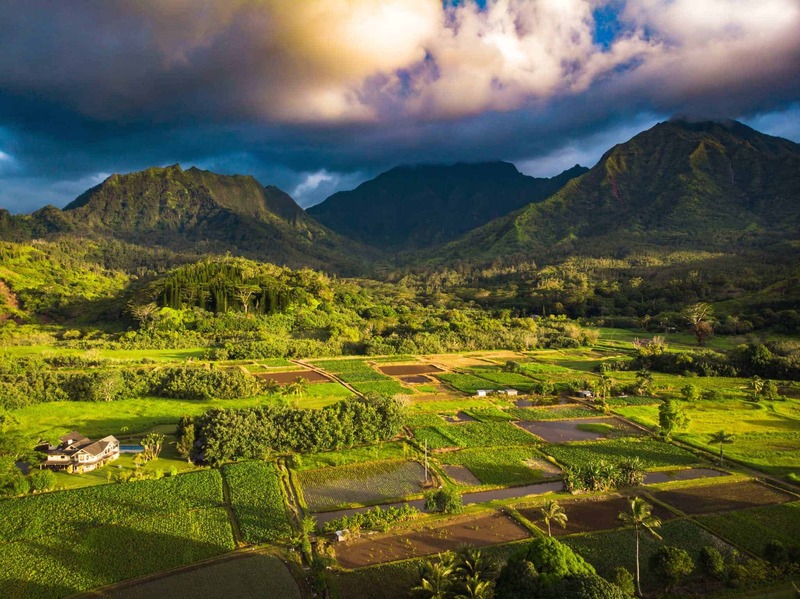 Kauai has become more popular in recent years, enough to the point that is was the main island we wanted to visit on our trip to Hawaii. It’s known for being one the prettiest islands and the most laid back vibe of the four main islands. 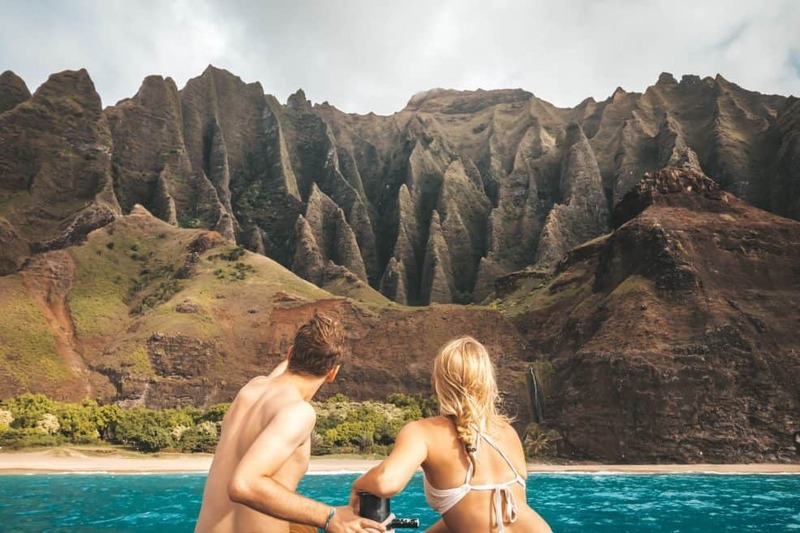 The main points of interest are Waimea Canyon, Hanalei Bay, and the Na Pali Coast. We also found it to be the cheapest of the islands. If you’re in search of beaches Kauai is not known for its beaches, diving, or snorkeling. Should You Visit More Than One Hawaiian Island? Visiting more than one island is a fantastic idea if you have the time. There are no ferries between the islands which means you have to fly. Hawaiian Airlines links all of the islands for an affordable price, but the time involved with checking out of your accommodation, arriving at the airport, check-in, flight time, car rental, and then arriving at your next destination can eat up an entire day (we would know we did it four times!) so you should assess your time wisely. Also, while flights are not expensive $150 on average does eat up a bit of the budget if you do a lot of hopping between islands. Generally, we would say spend at least three days on each island but recommend even more time to not feel rushed. When Should You Visit Hawaii? Hawaii is generally very busy. Its reputation and location in the middle of the Pacific draws in visitors from the States, Asia, and Australia. The high season generally runs from the end of November until April, with the peak being the holidays. During this time accommodation, airfare, and rental cars can be extremely high. The draw is the opportunity to escape the cold in the Northern Hemisphere and see humpbacks whales from October to May. The weather during this time sees more rain and cooler temperatures – granted still very mild. The winter also brings epic surf to the Northern shores attracting pro surfers from around the world, it’s great to see but dangerous for inexperienced swimmers. The next busy period would be the summer months when many take their summer holidays. If you’re looking for shoulder season “deals” look for the months of April, May, September, and October. 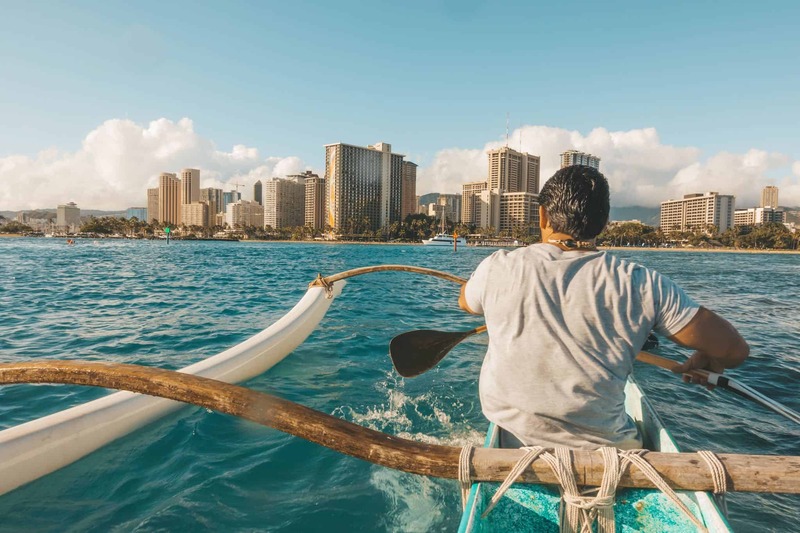 We almost always recommend September around the world as being the best month for travel and that is still the case with Hawaii. Keep in mind that Hawaii enjoys mild climate and temperatures all year round so there really is no bad time to visit. If you’re set on the busier periods of time it’s still possible to find some solace and space on the islands, but just requires staying away from the main points of interests and resorts. Kauai in July was quiet away for us when we were away from the resorts. The same goes for Maui and Hawaii. Whereas Oahu is busy year-round with plenty of military personnel and an island of one million people. The vast majority of arrivals will be into Honolulu International Airport (HNL) on the island of Oahu. It’s Hawaii’s primary commercial airport and serves domestic carriers along with many international carriers. 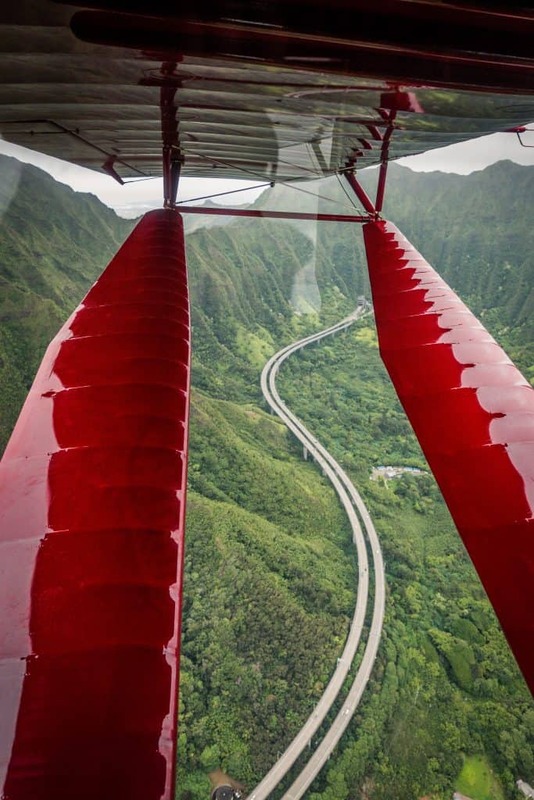 There are a number of direct flights from the U.S. mainland that still include Oahu, Maui, Kauai, and Hawaii Island. Once you arrive in Hawaii there are no ferries in between the islands so you’ll need to take inter-island flights, which the majority are operated by Hawaiian Airlines. When we were younger we loved to book the cheapest fare we could find. This often leads to multiple layovers and long days which gets exhausting. Now we like to opt for more direct routes and opt to avoid layovers even is it involves paying a bit more for the convenience. With a large number of direct flight from many US hubs to Hawaii it makes flying more hassle-free. We were stoked to fly with Hawaiian Airlines Honolulu to JFK. Since it was such a long flight between Honolulu and New York we decided to fly first class for the first time ever and now don’t want to go back. It started off beautifully with lay flat seats and delicious food. The flight attendants were a delight and embodied the “mea ho’okipa” spirit. Mea ho’okipa translates to “I am host” and refers to the warm hospitality given to guests on the Hawaiian Islands. We had a wonderful in-flight experience, including unlimited Mai Tai’s to get us in the mood. The plane that brought air travel to Hawaii! 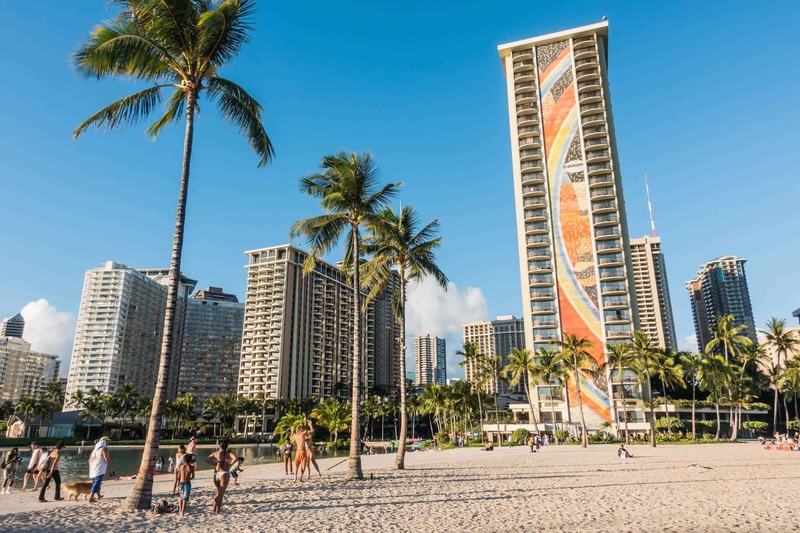 In the early days of Hawaiian tourism it was popular to stay on Waikiki Beach, but as the secrets of the outer islands have become revealed every traveler should spend some time exploring the islands on their own. We’ve often talked about how much we love having a rental car to travel because it allows us to properly explore. 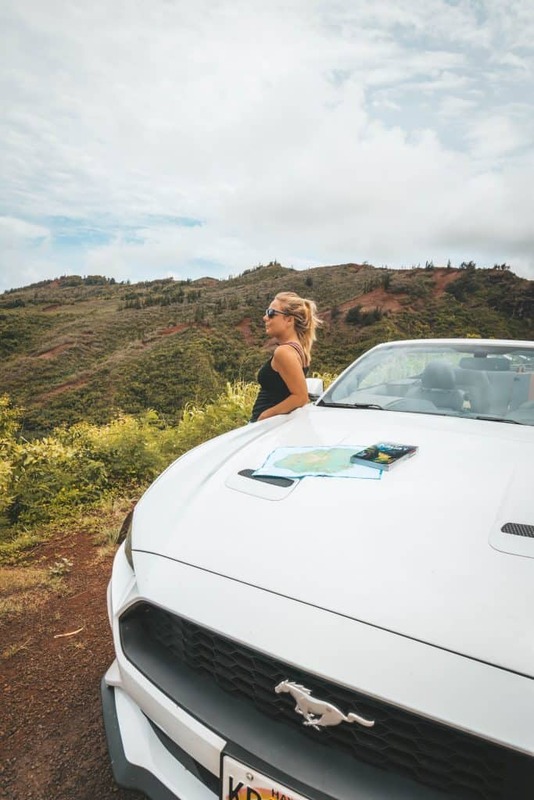 For our time in Hawaii, we used Avis across all four islands and had a good experience aside from the location in Oahu where Avis was painfully slow. 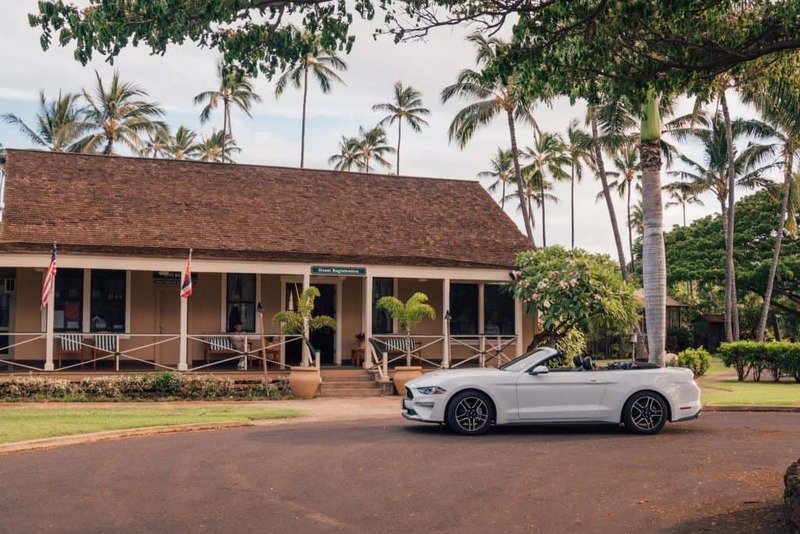 We even received two free complimentary upgrades to a convertible Mustang and Jeep Wrangler. These are arguably the two most popular rentals in Hawaii and you will without a doubt see them everywhere. When it comes to rental cars we like to decline insurance because we have primary CDW with our Chase Sapphire Reserve card. Additionally being a member of rewards programs through companies like National or Avis increase your chances of scoring a free upgrade. We’re rarely loyal to one brand of a car company, and find it varies from widely branch to branch – I like to look locally at the branches Google reviews to get a good feel for their service. If you’re looking at a short weekend getaway then you probably won’t run out of things to do or places to eat. However, once you spend several days in an area you’ll want to dig a little deeper and explore. 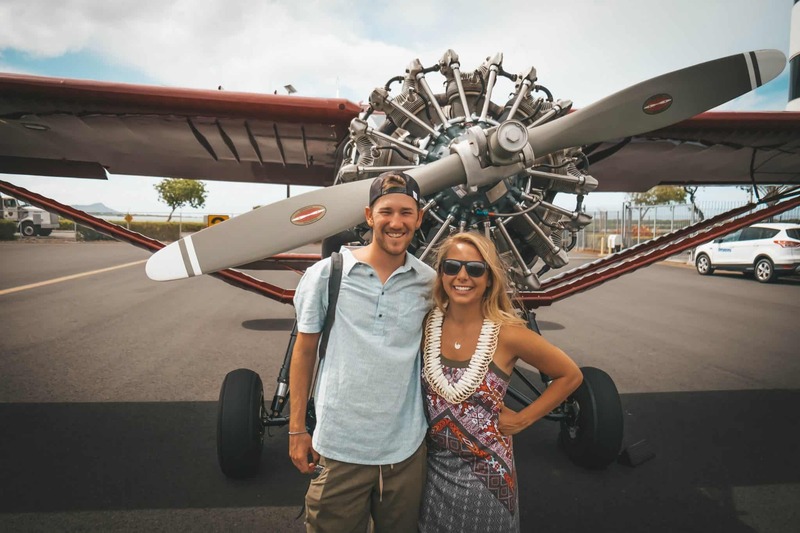 One of the best resources we had available was the Hawaiian Airlines Insider’s Guide, written entirely by people who know the islands very well. The island guides have detailed information on their favorite establishments. Lonely Planet guidebooks are another accessory we love to pick up when we travel. They are great for plotting points of interest to each unique traveler. If you want to find the best spots to go snorkel on your own or where to find a poke bowl this is where they can provide great insight. We used these resources to plot points of interest and then planned our days as they come. Or you can check out awesome travel blogs (like ours) to help plan your days. We are not big fans of planning our days out in advance. Instead, we implement a different strategy of plotting points of interest and having a multitude of options to pick and choose as we please. We like to do this by using a custom Google Maps. It’s pretty simple to do if you have a Google account and the application installed on your smartphone. Simply save the points and add any notes that you see fit. Planning your days as they come avoids the stress of feeling you need to stick to an itinerary and lets you check out saved places based on your location. When it comes to tours and activities we do recommend booking those in advance. The best tour companies often sell out well in advance, especially in the high season. However, you never know in July we were able to get two spots last minute on a Napali Coast tour, but struck out of luck for Molokini Dive. I would recommend not planning a tour or activity for every day as that will be tiring and leave little room for exploration. 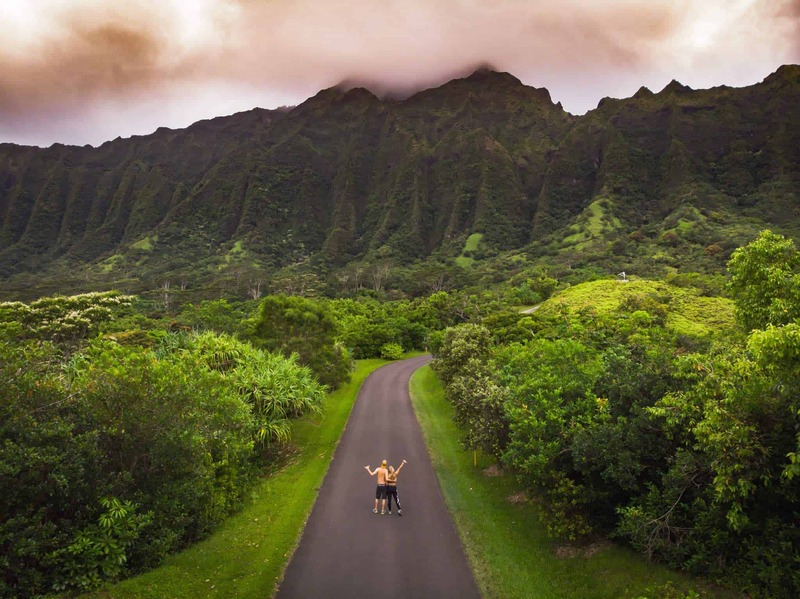 You do have to be careful not to overwhelm yourself as there are a ton of enticing activities on the Hawaiian Islands like surf, snorkel, sail, hikes, bikes, zip lines, quads, and food tours. You will never feel like you stayed too long in Hawaii. There is simply too much to do and see. If you can swing it consider adding a few days to your itinerary. It’s too long of a flight to miss out. Accommodation can have one of the largest impacts on your trip so it’s important to get it right. There are a wide range of options and budgets to fill your accommodation needs around Hawaii. Options range from luxury beach resorts to a tent in a public campsite. The location will also have a large impact on the accommodation you choose as you’ll typically find some of the best beaches blocked off by private resorts. We’re big fans of self-catering accommodation and enjoying our time in quieter local areas, but it means we have to drive to popular attractions. 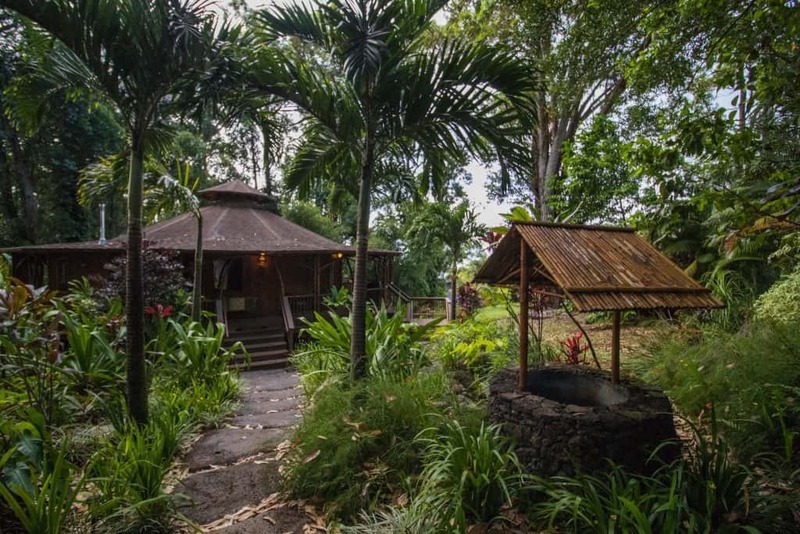 On the islands of Oahu and Maui, we had the amazing experience to stay at two very unusual properties through Glamping Hub. The first being a bamboo cabin in the nice community of Haiku on the island of Maui. It was so relaxing and our place had a full kitchen, living area, and a private hot tub. Mornings were spent sipping Kona coffee and listening to the birds far away from the distractions of resorts. 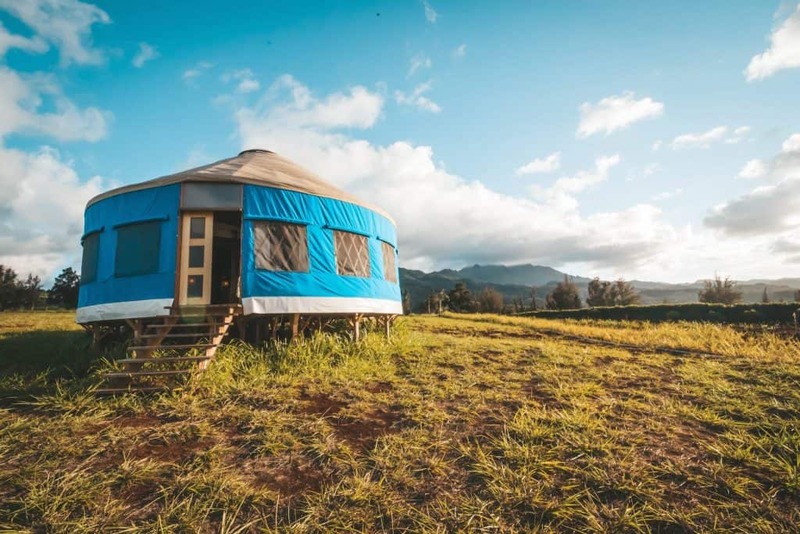 On the island of Oahu, we spent our time in a yurt with Ohana Yurts near Haleiwa. We loved chatting with Jenny and Nathan about their yurt project – check out their TV show! With properties like these, you have a much more personalized experience that you won’t find at hotels or resorts. You have a lot of options to stay in self-catering in Hawaii. Booking these through the various sharing economy sites like Glamping Hub or Airbnb is easy!. 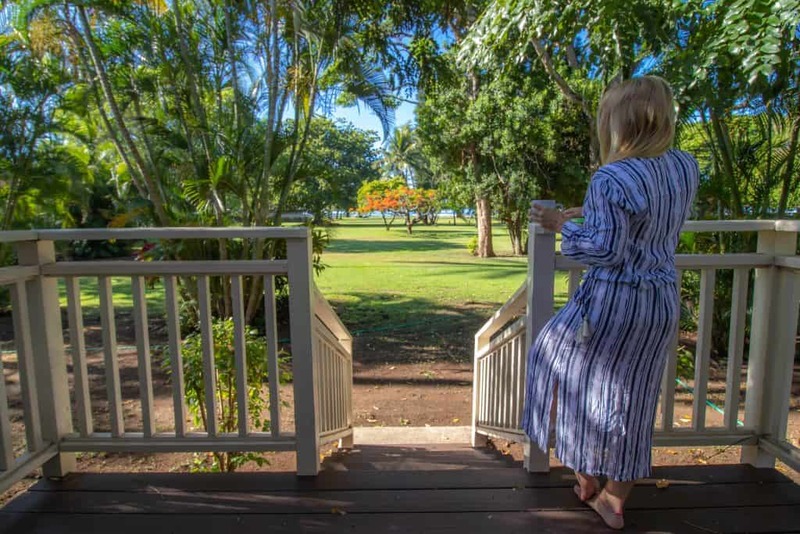 Or you can seek out resort style self-catering options like Waimea Plantation Cottages on Kauai. That is where we stayed on the Garden Isle and had a fantastic time in their refurbished cabins in the small town of Waimea. Self-catering options allow for more privacy away from the big resorts and allow you to cook your own meals. Food costs in Hawaii are high so the ability to cook your own meals can save you a lot of money. If you’re looking to relax in the lap of luxury and sip mai tais by the pool there are plenty of resorts on the Hawaiian Islands to enjoy. The majority of resorts are built in certain neighborhoods together and offer direct access to a semi-private beach – you can’t own the beach but the land around the beach. These resort communities are built so guests never have to leave with golf courses, shopping malls, coffee shops, movie theatres, and chain restaurants. On the island of Hawaii, we stayed at the Hilton Waikoloa a massive resorts with multiple restaurants, pools, waterslides, and activities. 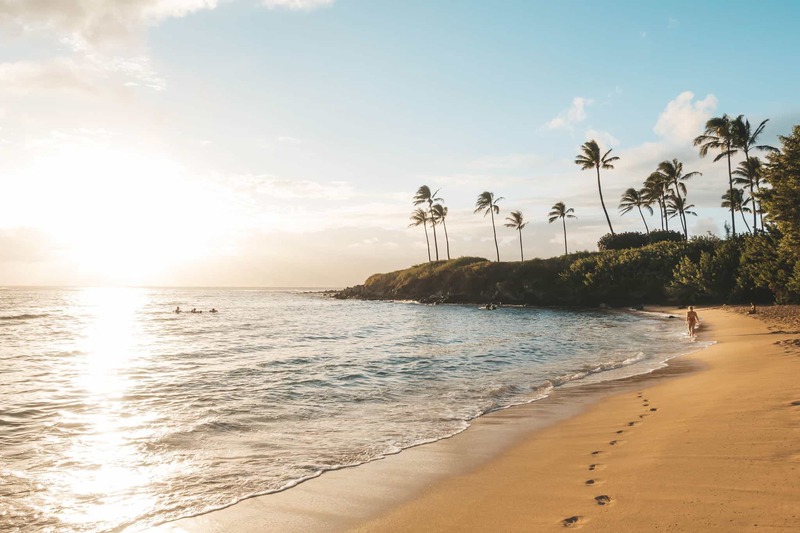 If you’re interested in staying at a beach resort Maui is most known for its resorts with the Four Seasons, Grand Waimea, Sheraton, and Westin. 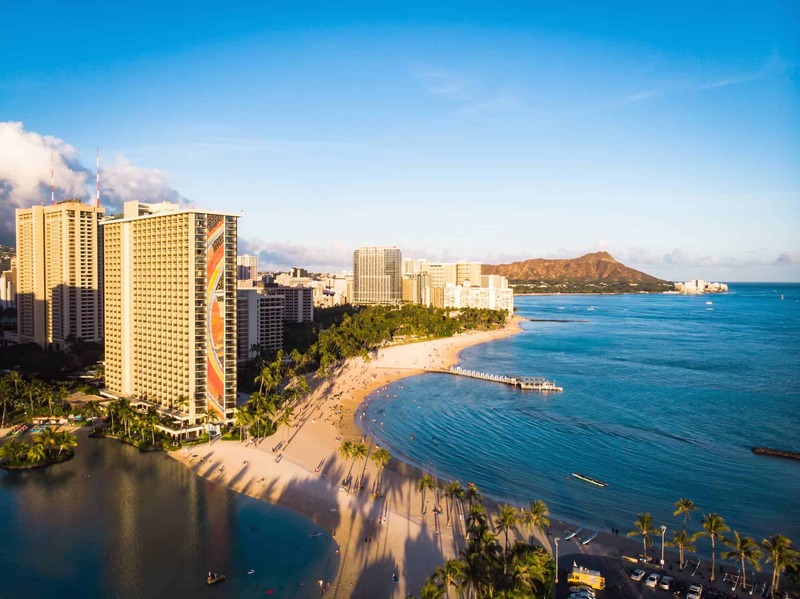 There are plenty of traditional hotels in Waikiki and scattered throughout all the islands. You won’t find many of the standard big chain hotels like Comfort Inn, Holiday Inn, DoubleTrees, or Residence Inns. Instead there are a number of smaller boutique and independent hotels around the islands of Maui, Hawaii, and Kauai. With an amazing amount of beautiful landscapes, hiking trails, beaches, state parks, and even national forests there are plenty of places camp. Most sites require prior reservations and planning in advanced. I suggest having a good idea of where you intend to camp before heading to Hawaii. You will need a car to embark on a camping adventure. Trucks are a good option for families who need lots of space for supplies. Wondering what to wear in Hawaii? Check out our ultimate Hawaii packing list.